유비퀴놀 은 일반 CoQ-10 보다 3배 체내 흡수력을 높힌 고품질 제품 입니다. 이용방법 : 1일 1~2회, 1회 1정씩 물과 함께 드십니다. Other ingredients: safflower oil, gelatin, glycerin, beeswax, lecithin, water, polyglycerol fatty acid ester, caramel color. Contains soybeans. 쌀, 설탕, 인공감미료, 인공향료, 인공색소 및 방부제 등이 일체 포함되지 않았습니다. This product contains NO milk, egg, fish, peanuts, crustacean shellfish (lobster, crab, shrimp), tree nuts, wheat, yeast, gluten, corn, or rice. Contains NO sugar, and no artificial sweeteners, flavors, or preservatives. When it comes to choosing a CoQ10 supplement, the primary factor is how many swallowed milligrams actually make it into your bloodstream. Coenzyme Q10 is a notoriously difficult nutrient to absorb. A recent study showed that in seriously ill patients, conventional ubiquinone CoQ10 was hardly detectable in the blood, whereas the new ubiquinol resulted in significant blood level increases and subsequent clinical improvements. Japanese researchers have developed a novel ubiquinol delivery system that has been shown to double-peak CoQ10 blood levels (i.e., 100% greater peak absorption) in mice compared to the original ubiquinol formula. 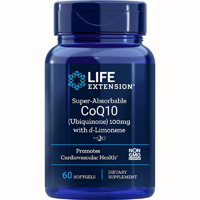 This enhanced ubiquinol formula also achieved a 66% greater amount of CoQ10 in blood over 24 hours compared to the original formula.11 Life Extension is the first supplement company to distribute this enhanced-absorbing ubiquinol.